"Bill, the piano track is just super, exactly what I needed and fit right in seamlessly. Great work, thanks!" John Henderson, Switzerland. You can hear our keyboard player's work all over this site. Need Hammond B3 organ? Strings? Synthesizer? We have all those available. Note that the above string track is also an example of live violin and viola added to the keyboard generated string track. A keyboard string track is just $15 extra with a piano track at regular price. Contact us via e-mail for pricing if you'd like to add the live violin/viola as well. "Awesome, strings sound GREAT!" Donovan Farrell. Later Donovon wrote: "You guys did so awesome on the last song I was wondering if I could get strings plus live violin and viola on the attached song?" He was thrilled with that project also. Why order from us? We have proven pro quality session players, playing on a professional quality instruments through quality gear. Piano players around the country offer tracks over the Internet. But they will likely not be professional session musicians who do sessions day in and day out like the piano players we use. 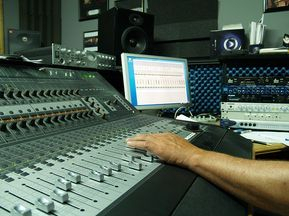 Why settle for a semi-pro when a session quality player is a few clicks away? Pay less get less. Pay more you'll still get less! *Regular rate is $125 per piano track, 3 song minimum. But we have songs already scheduled to record. Order NOW and the price is $95 per track with no minimum number of songs! For the entire menu click under the word "MORE" in the top right corner of our site! It's so EZ to add a piano track, B3 organ, strings or synthesizer to your project, played by a Nashville professional session quality player,, right over the Internet! Step 1: Make an mp3 stereo mix of your project. It's optional to add a 1-2-3-4 count off upfront or a click track with the click (metronome track) panned hard left and your drums, guitar playing, etc. panned hard right. It's possible for us to work without the click but it will likely be tighter with (provided your instruments are locked in to it also). A vocal, even a very rough scratch vocal, is extremely helpful as well. But it's best to keep the vocal fairly low in volume in the mix, just enough for the player to hear where the vocal phrases are placed without interfering with their ability to lock in to the music. Step 2: e-mail the MP3 mix to nashtrax@bellsouth.net along with any notes. Step 3. Send payment via PayPal to nashtrax@bellsouth.net. For $95 you'll receive one piano part (or 1 clavinet part, b3 part, synth track, etc). If you purchase a $95 piano track, you can add your choice of either keyboard generated strings or B3 organ for just $15 extra per song. Discount to $85 each for two songs or $75 each for 3 or more songs. The sample clips are of our piano player playing on client recordings. "Moonlight, Moonlight" "You Are Glorified" "Baby Come Home" "Drive Thru Love" and "Dream" are © 2013 by the publishers and songwriters, Used by permission. All rights reserved. Unauthorized use is a violation of U.S. and international copyright law. All sample tracks and Tracks Online projects are produced by Bill Watson. We also do tracks for other recording studios in the U.S. and worldwide and have never once attempted to "co-opt" a client. Studios: your secret, and your clients are safe with us! Interested in booking studio time for your band or solo project at hourly rate? Use your credit card to send $375 to nashtrax@bellsouth.net via PayPal.com to pay for the minimum 5 hours of time at Nashville Trax Recording Studio which will confirm a 1 day booking. Engineer is included. Balance, if any, will be due in cash at days end, prior to mixes or files being exchanged. Additional days can be scheduled if needed at that time. Per hour rate is $75 per hour. E-mail or call 615-319-8616 immediately after or just prior purchase, to schedule the date and start time and obtain specific pricing for your project. Professional session quality musicians and vocalists are available upon request. Extra per-song or hourly charges apply for musicians and/or session singers requested. 48 Hours notice required to schedule a session. All song material on this site is presented for demonstration of production values only. All other uses prohibited under U.S. and International copyright law.